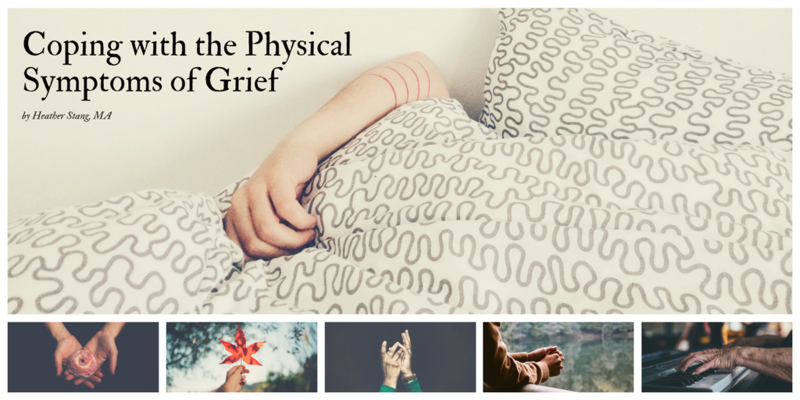 Most grief professionals, myself included, will suggest you start by tending to the physical symptoms of grief. A visit to your naturopath or physician is a good place to start. A simple check-up when you are in the early stages of grief with a wellness consultation may help you stay healthy during a time when your immune system may be low. If you are experiencing grief-related insomnia or are not eating properly, your mood will suffer in addition to your body. Changes in sleep patterns and appetite are normal symptoms of grief, but do what you can to stay hydrated by drinking 8 glasses of water each day, eating regular, healthy meals, and getting plenty of rest. Everyone experiences the physical symptoms of grief in their own way, but the most common ones include: hollowness in your stomach, tight heart and chest area, aching arms, shortness of breath, low energy, dry mouth, muscle weakness, nausea, and even loss of coordination. It is important that you refrain from any activity that could cause you additional harm, such as driving, until you feel rested and clear headed. Though it seems almost too simple to be effective, your breath is a powerful antidote to mental and physical suffering. Have you noticed that your breath has become more shallow? You may feel like you haven’t taken a deep breath since your loved one died. Shallow breathing keeps your body in a state of fight or flight, and can lead to physical tension, digestive problems, and fatigue. You can access your breath right now. Stop reading for a moment, close your eyes and take a few full breaths. Feel your inhale expand your belly and your lungs. Notice the release that happens on the exhale. You may benefit from receiving therapeutic massage, yoga therapy, acupuncture, or other holistic bodywork. The grieving body is often tight and achy. Bodywork will help release the tension, and in some cases, the tears. True professionals will know how to support you when emotions arise during a bodywork session. 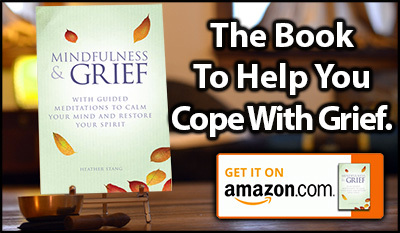 In many cases they will help you mindfully experience your grief, which will provide some relief. If you are suffering from grief related insomnia, guided relaxation meditation for grief before bed may help. Mindful breathing will signal your body that it is safe to relax.